Trenčín, thanks to its geographical and strategic location in the valley of the river Váh, belonged to important towns in Slovakia as early as in the history. Archaeological findings proved settlement of the Trenčín region as early as in the Older Stone Age. At the beginning of our era, Romans moved borders of their empire as far as to the river Danube where they built fortified camps. Trenčín has a unique proof of their presence in a form of an inscription on the castle rock, which commemorates victory of the emperor Markus Aurelius over Quadi in 179 A.C. at Laugarício. In the era of prosperity of the Great Moravian Empire, Trenčín belonged to the Nitra Principality. This region became a part of Hungary in the first half of 11-th century. Trenčín became a seat of the Border District Administration and later the centre of the Trenčín Royal District Administration and the See of the Estates. After invasion of Turks in 13th century, it was devastated. In 1275, the castle became a property of an important magnate Peter Čák. His son Matúš Čák gained control over nearly the whole territory of present Slovakia. His dignitaries in the Trenčín Castle, which was his main residence, had similar titles to those in a royal court. The period of the top of his glory was also the greatest prosperity of the town. The Matúš's possession broke up only after his death. History glorified him as a Slovak national magnate. Trenčín was raised by the King Zigmund to a free royal town in 1412. Like other European towns, neither Trenčín has avoided many disasters and wars. In the half of 17th century, the town had to resist invasions of Turks, however, they failed to conquer Trenčín. The town also experienced great suffering at the time of blockage by Kurucs in 18th century, when the town was attacked by plague. The castle burned down at the end of 18-th century and its renovation started in 20th century. Trenčín became a trade and industrial centre of the central Považie (the river Váh valley region) in the second half of 19th century. Establishment of many industrial enterprises, financial and monetary institutions and as well as a completed railway connection to Žilina contributed to it in rather bit extent. Especially clothing and foodstuff industries also developed in the town during the first Czechoslovak Republic. By building exhibition halls, an important branch - organisation of exhibitions - started to get its shape in the town in 60s. At present, Trenčín is a town which provides its visitors a large offer of cultural and historical monuments and a large number of social events. This offer contributes to development of the town and makes it be an important centre of tourism. Matúš Čák's treasures and memories of a powerful oligarch survived in many legends. A legend on Matúš's treasure, hidden together with a dead domineer somewhere in the Trenčín Castle, or its vicinity, has excited a human's imagination for centuries. However, his tomb has never been found. Even Matúš himself could also see about the concealment being aware of the fact that he has no successors, or his tomb could find itself in the hands of enemies. More over, he was also a heretic, on whom a verdict was brought. Maybe, his servants buried him inconspicuously and then died in conquering the Trenčín Castle. Trenčín is one of few towns, which can boast that they have a large number of cultural monuments. The Trenčín Castle belongs to landmarks of the town. It is located on a limestone rock on which, just below the gun bastion, the well-known Roman inscription on victory of Romans over Quadi at Laugarício settlement, dating from 179, is cut out. 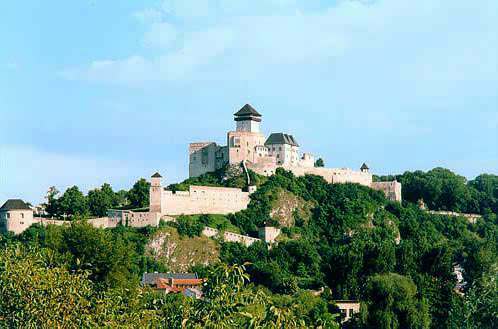 The castle is built in the place of a Slavonic hill-fort and it had been a royal guard castle since 11th century. The Roman rotunda, the debris of which can be found in the upper courtyard, is probably the oldest object. The Matúš's tower comes from 11-th century and got its present shape during reign of Matúš Čák at the end of 13th century. A set of original Gothic palaces is attached to the tower: the Matúš's palace (it does not exist at present), the Ľudovít's palace, the Barbora's palace and the palace of Zápoľský family. The gun bastion, the chapel, and especially the renown Well of Love, to which a legend on love of the Turk Omar to beautiful Fatima is related, dominate in the lower part of the castle. The object of barracks and the Clock Tower also attract attention of visitors. The covered staircase, built in 1568, leads from the square to the Parish Church, which provided fast movement of defenders of the town to the outer walls next to the church. The stairs, which are open in an arcade on the left side, were used as a connection to the armoury built in 1565 in the St. Michael's Chapel. Later, the stairs were destroyed to a large extent by fire in 1708. They were used as a public communication after the repair. The present shape of the stairs is a result of the monument renovation in 1978 - 1981. A tombstone with a Latin text from 1724 was found during the renovation work. The tombstone is exhibited in the stone room in the Trenčín Castle nowadays. The museum is a Late Baroque three-floor building form 1761. District congregations were held in the representative rooms on the first floor in the past. Paintings of heads of district administration from Trenčín from times of Ileshazy family used to hang in individual halls. The museum resides in the building of district administration from 1939. A permanent natural science exposition can be found in the former representation rooms at present. Regular exhibitions from internal collections of the museum are organised in the exhibition halls. The gallery of M. A. Bazovský resides in the rooms of the former Piarist Monastery. In addition to exhibitions of mostly modern art and sculpture, two permanent expositions of M. A. Bazovský and an exposition of artists, painters, sculptors of the Trenčín region can be seen here during a year. The refectory and the pharmacy with Baroque decorations will attract your attention in the interior. The Neo-Romantic building from 1913 was built in a place of the former tabernacle. The building is of a central type with a central cupola, inspired by Byzantine and Oriental architecture using modern reinforced concrete structures. Architects Fuchs and Neigreis prepared the project. At present, one part is used as a tabernacle and the other part with the central room under the cupola is used for cultural purposes. Originally, it was built as a water fortification. Its construction dates from 17th century. It was modified into a Baroque style in 18-th century. The chapel of St. Mary's Birth was annexed to it later. The Baroque interior consisted of the altar of St. Mary's Birth and the side altar of St. Ján Nepomucký's Death. The coats of arms of Wolfgang Šeréni and Kristína Balažová are installed on the tower of the manor house. Other two coats of arms, of Barbora Orlaiová and Andrej Šeréni, hang above the entrance of the chapel. An English park spreads around the manor house.